As you may have heard, I like to bake. But when you’re churning out a big batch of treats weekly, expenses such as eggs and spices really start to add up. So I decided to do some (slightly) more rigorous comparison shopping. Now that I’ve tackled exotic cinnamon and organic eggs, the next line item due for a test is vanilla extract. 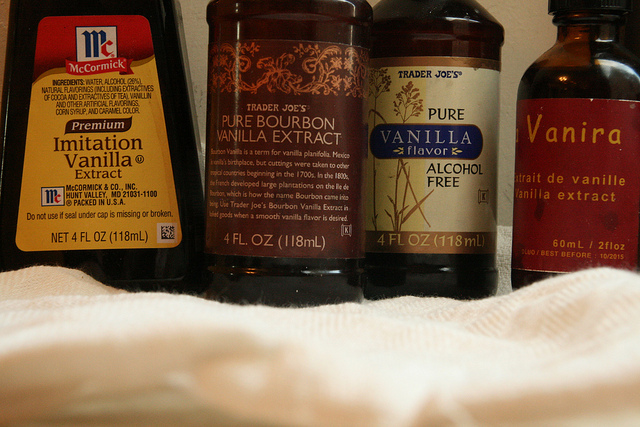 Vanilla finds its way into everything I make from cakes, to cookies, to brownies and puddings, and I can’t confidently tell you whether there is a difference among the myriad of bottles on the market. I can tell you right off the bat that if you can afford vanilla beans, you should buy those. Since I’ve been out of high school and my parents are no longer directly funding my baking habit, I have only used vanilla beans once, when someone on the streets of San Francisco handed me one. It was packaged, so chances were fairly high that it wasn’t laced with something, although in retrospect, that was definitely a risk. I hoarded the thing for weeks, searching for a recipe worthy of such a prize. I believe I ultimately used it in a pastry cream, and there’s no question in my mind that it made a difference. But nowadays, unless I’m making something for a really special occasion, when a recipe calls for vanilla bean, I replace it with extract. The question is: which bottle is best? Overall characteristics: Very dark in color, definitely very alcoholic- tasting and -smelling. Whipped cream: This ranked second in the whipped cream test. It tasted quite alcoholic, but that might be nice when paired with a bourbon banana cream pie or something that could use a little bite. Overall characteristics: This tastes almost sweet. It’s very odd, in fact, if you’re used to working with vanilla, to smell and taste a variety unaccompanied by that distinctly sharp, medicinal tinge. Whipped cream: This produced the best whipped cream. Although I added no sugar at all, this tasted like sweetened cream. Overall characteristics: This does not taste like “normal” vanilla. It’s almost clear, or very lightly tinged brown, and it tastes floral and aromatic. Whipped cream: If you like the flavor of Tahitian vanilla, which I do, you will like this. While not particularly “vanilla-y,” this whipped cream definitely had a note of subtle sweetness. 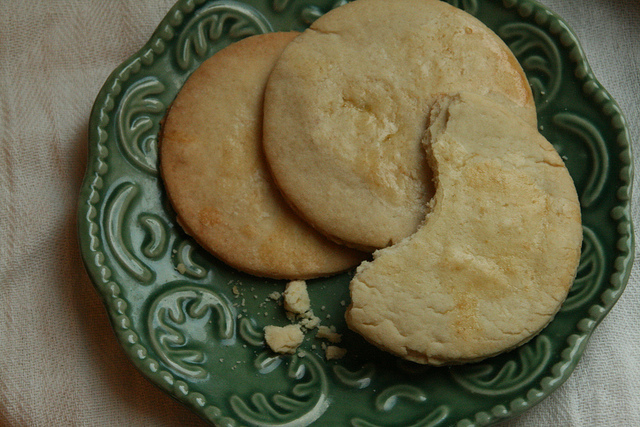 Sables: The cookies made with Tahitian vanilla were the only ones that produced any distinguishable flavor. They had distinct aromatic undertones, which did not have a potent flavor but certainly possessed a floral taste. Overall characteristics: A drop of this on my finger was definitely disgusting. It tasted like a chemical. Dark brown in color, it is certainly attempting a vanilla flavor, but it doesn’t really come close. Plus, it costs the same, somehow. What? Whipped cream: Flat. Almost no flavor, and the flavor that was there wasn’t great. Sables: Oddly, this didn’t make a difference. I had been warned of a bitter aftertaste, but I have to say it made no difference in these cookies. Unheated, these vanillas each had a distinctly different flavor. In the future, for these purposes, I would say each has its place, except for the imitation vanilla which I would like to evacuate from my kitchen cabinet at the soonest possible moment. If you want an alcoholic flavor, which you might for something that needs a counterpart with a bite, go with the Bourbon Vanilla. I went into this thinking that there was no place for non-alcoholic vanilla, but I think if you’re looking for something sweeter but still approximating the standard vanilla flavor, it’s a good option to have. Those looking for a more exotic, flowery taste should definitely spring for the Tahitian stuff, if you’re willing to spend that much. I never would have had it not arrived in my cabinet straight from Tahiti, but I’m glad to have it around. Since it’s pretty much clear, if you’ve ever in need of a totally white cake, cookie, or pudding, unadulterated by the faint tan tint of classic vanilla, this is your option. In baking, however, all of the cookies tasted virtually the same. Except for the Tahitian variety, as mentioned above. Even the imitation vanilla passed with flying colors, producing a totally decent vanilla butter cookie. When baking, I think I’ll stick to the Bourbon stuff. It’s a cheap option that doesn’t taste at all fake. Unless I’m making a yellow cake to be paired with fruit, or some other baked good which I think might benefit directly from the aromatic undertones of Tahitian vanilla, I think TJ’s will do the trick. All of this is moot if I run into another stranger handing out vanilla beans.